This is mehndi or what is commonly known as henna. The body art of mehndi is generally done traditionally on the bride-to-be as a form of beautification and to signify marriage. These days it's used as a fashion statement. 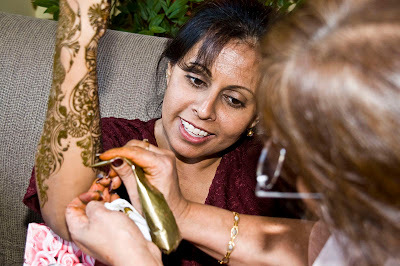 My younger sister, Vinie, got married on October 6, 2007 and her mehndi was done the day before as you see in these pictures. The mehndi artist was very talented, fast, and creative. By the way, the mehndi art work is not cheap. The prices are usually a few hundred dollars but could go above the thousand dollar range depending on the artist and artwork desired. Oh ya, once the mehndi is applied, you have to keep it on for a few hours with frequent dabs of lemon juice to help it set and to enhance the strength of the color. Then, it fades away in a few weeks! Wow, that looks really good. Bernie and her friends have had that done back in college.